Masuri bin Salikun has been widely regarded as the father of modern Malay poetry in Singapore. Born on 11 June 1927, Masuri led a carefree childhood but also witnessed the hardships of people around him. These formative experiences moulded him into a brave, disciplined and dedicated man who empathised with the less privileged. Masuri was formally educated at Telok Kurau Malay School. Being exceptionally bright, he excelled in his studies, and was interested in reading and writing. Driven to uphold the status of the Malay language, and concerned for the continued progress of his community, Masuri became a teacher, and co-founded “Angkatan Sasterawan 50” (“The Singapore Malay Writers’ Movement 50”), or “ASAS ’50”. Despite being a prolific author, Masuri was a humble man who loved his community and country. 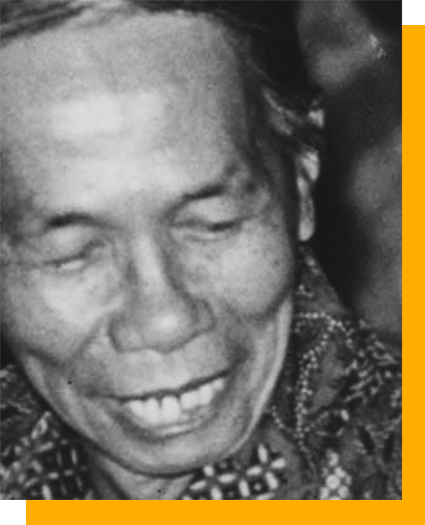 He left behind a great legacy, which continues to influence the Malay literary scene to this day. Masuri understood that the Malay community’s high regard for their British colonisers impeded their own progress. Therefore, when Singapore fell to the Japanese, Masuri felt that they could reverse the British’s manipulation and degradation of the Malay community. This gave Masuri hope—a hope that envisioned the independence of his nation. Here, Masuri calls for his people to be united and to fight against the ones in power who were not bringing any good to the masses. Known for his interesting and clever wordplay, anyone who reads Masuri’s poems would be intrigued to discover the meaning and significance behind his ideas, as his poems allow for multiple interpretations. As someone who always made himself present within the community, Masuri felt the need to write for his people. Masuri wrote with purpose. His intentions were always towards bettering society—whether it was to make people aware of the problems plaguing the community, or to motivate Malays to stand up and progress as a community. He was the voice in his community who was deeply concerned with the development of the Malays. But Masuri was not a selfish man. Injustices or issues that affected the political, economic, and social conditions of the masses—regardless of ethnicity or religious background—would similarly compel Masuri to critically express his views and thoughts through his writing. He strongly believed that everyone deserved to be respected and treated fairly regardless of their social status. Masuri was a visionary humanist. Masuri also empathised with the less privileged, especially the marginalised. In “Pandanglah Kami,” he sought to raise awareness of the manual labourers who worked hard in undesirable conditions in order to make ends meet. Masuri observed that the hard work of labourers were taken for granted by the more privileged members of society, even though their labour made the provision of rice, bread, or cloth possible for these people. This urged him to write poems to raise awareness amongst those who were living comfortably to appreciate the efforts of these labourers. Masuri’s passion and his love for his country and community motivated him to write, criticise and inspire others through his works. His works urge his readers to possess the right moral compass in whatever situation that confronted them. As in the Malay proverb, “harimau mati meninggalkan belang, manusia mati meninggalkan nama,” Masuri’s contributions to Singapore’s literary scene continues to inspire others. Mohamed Abdul Aziz, Mohamed Pitchay Gani. Di sebalik tabir Masuri S.N. : biografi dan karya pilihan yang belum tersiar.Singapore: Bizmedia Publishing, 2015. Suratman Markasan. Tiga warna bertemu: antologi puisi penulis-penulis Singapura / diselenggarakan oleh Suratman Markasan. Kuala Lumpur: Dewan Bahasa dan Pustaka, Kementerian Pendidikan Malaysia, 1987. Masuri S.N.. Puisi-puisi pilihan Masuri S.N. Kuala Lumpur: Dewan Bahasa dan Pustaka, Kementerian Pendidikan Malaysia. 1989. —Mimpi panjang seorang penyair. Kuala Lumpur: Dewan Bahasa dan Pustaka, Kementerian Pendidikan Malaysia. 1995. “Contributor”. Words Without Borders. October 2016. Web. 24 March 2018. “Masuri bin Salikun”. Singapore Infopedia. 2005. Web. 24 March 2018.